In today’s technology-driven world, making sure your company has the ability to embrace and master digital transformation is a key differentiator in an increasingly competitive marketplace. The business environment is changing constantly, and to conquer new digital territory and the transition to Industry 4.0 (smart production), what’s needed is a more agile way of working, a willingness to take risks, and a “fail ’n’ learn” culture. Open innovation is a must for all businesses, irrespective of their size, sector, or track record. A number of large and established companies already have these digital goals and corporate innovation methods embedded within their structures. But unlike large corporations, many mid-sized companies are still struggling to set up or manage open innovation projects and enter into collaboration with digital and tech startups. 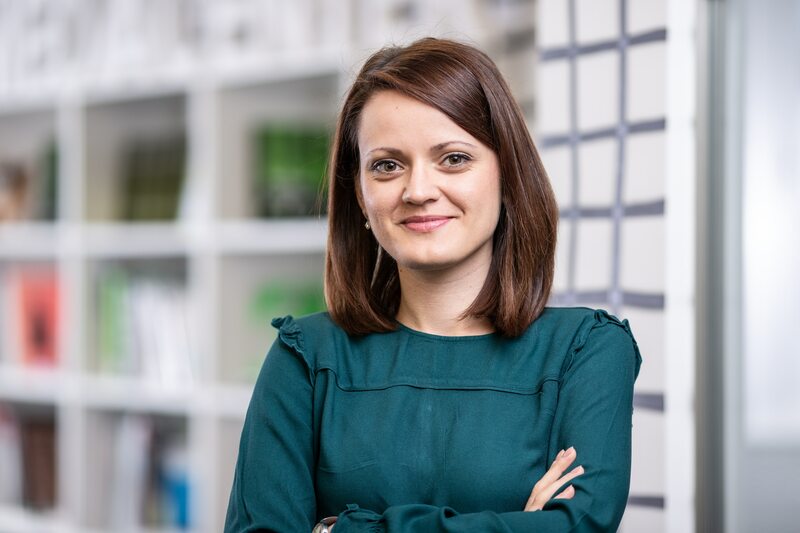 Tapping into its diverse network of digital experts, startups, and lateral thinkers, CODE_n has joined forces with Deutsche Bank to bridge the “collaboration gap” and bring two worlds together. Two groups – consisting on the one hand of medium-sized enterprises (SMEs) from Baden-Wuerttemberg and on the other, Deutsche Bank’s corporate customers – met up with hand-picked, innovative startups to kick off an initiative called Impuls:Digital. This innovation format plunges all parties into an exciting world of exploration and development. A pilot event was already held last year at CODE_n SPACES in Stuttgart. 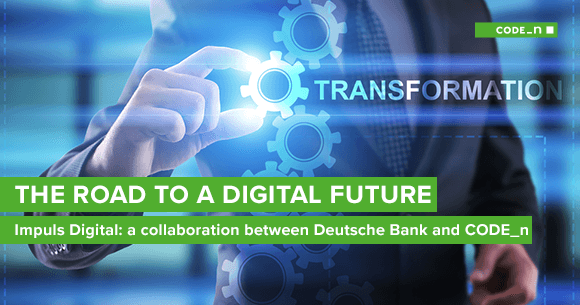 It was the first time CODE_n partnered with Deutsche Bank to explore different ways to foster dialog and an open innovation culture in mid-sized firms. 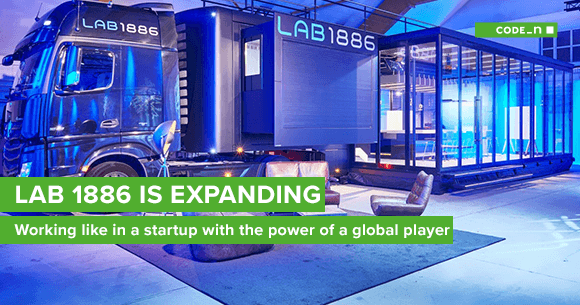 The initiative got underway after Deutsche Bank turned to CODE_n for its expertise, its vast network of startups, and its contacts to a whole host of top-notch innovation experts and coaches. The financial giant is devoted to helping its business clients roll out bold innovations and ratchet up digital capabilities, so it joined forces with CODE_n and developed a unique interactive format that would offer inspirational talks, workshops, speed dating, and successful business networking. To follow up on last year’s successful edition of Impuls:Digital, Deutsche Bank and CODE_n decided to replicate the format and launched a new series of events, this time focusing on injecting life into digital transformation and achieving win-win outcomes for everyone. Two further editions took place this year in June and July. 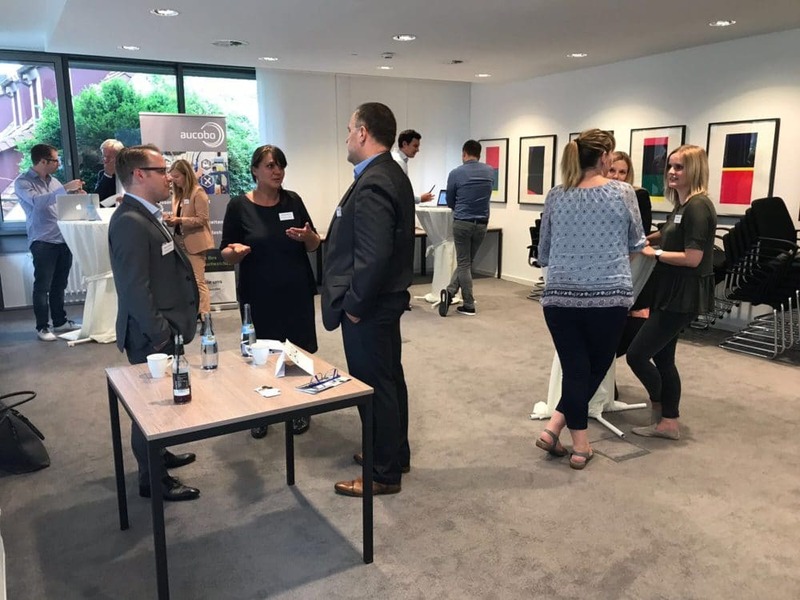 They were organized in the cities of Ulm and Heilbronn, and Deutsche Bank invited a select group of mid-sized companies to delve deep into digital transformation issues, explore new and innovative methods, and develop creative ideas. Inspiration – this warm-up phase was dedicated to opening speeches by Deutsche Bank, CODE_n managing director Moritz Gräter, and the researcher and entrepreneur Martin Allmendinger, the founder of OMM Solutions. They spoke about key trends, new approaches with the potential to unlock digital transformation, and the main do’s and don’ts of effective startups involving corporate collaboration. 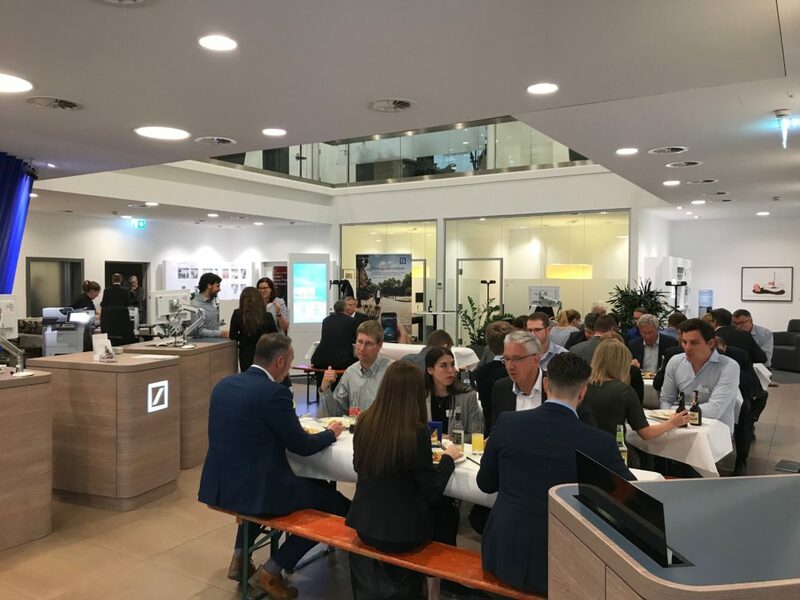 Collaboration – Deutsche Bank’s corporate customers were paired with the curated startups and participated in speed-dating sessions, opening the door to potentially long-term and mutually beneficial partnerships between startups and corporates. This format provided important help with sharing need-to-know information quickly, and it also encouraged participants to mingle and give feedback. Creation – to motivate participants to think up alternatives and explore new and creative approaches to problem-solving, they were introduced to design thinking and ways to use this method in business innovation and digital business modeling. Coaches, certified design thinking professionals, and our colleague Robin König shared a 360° view of various business modeling methods and ways for their companies to develop new products. “Small and medium-sized enterprises often find it difficult to leave familiar paths and undertake the digital transformation journey. Together with CODE_n, we held two innovation workshops this year at our branches in Ulm and Heilbronn under the name Impuls:Digital. The events were truly inspiring, filled with innovation, networking and new methods, brought to life by a good mix of speakers, trainers, startups and motivated SMEs. “ The success of this format at our branches in Baden-Wuerttemberg has shown that creativity and innovation are not necessarily linked to a certain unconventional environment but are rather determined by the right mindset”, says Dr. Christian Stotz, Managing Director at Deutsche Bank, responsible for the Stuttgart/Baden-Wuerttemberg region. Overall, the innovation format is a great opportunity for the different parties to meet new people and line up one-on-one meetings. It also exposes perhaps more traditional, mid-sized firms to new ideas and provides options for successfully collaborating with startups. These workshops are about fully embracing digital transformation. All businesses are now feeling the impact of digital technology and if anything, things will only get more challenging, so it’s important that SMEs also take steps to future-proof their business now and respond appropriately to digital disruption. More than ten B2B startups from Baden-Wuerttemberg and the CODE_n SPACES innovation campus attended the session, which was an ideal opportunity to meet executives and managers, the majority of whom work at local medium-sized firms. Their businesses are considered world-class players in their field, so the aim was to provide a forum for exchanging know-how, discussing experiences, exploring different technology topics, and finding out more about different ways of working together. Fostering collaboration between SMEs and startups offers a large number of benefits to both parties. Startups can learn more from established companies about organizing operations, dealing with financial issues, and doing more to establish their business on the market. In return, SMEs benefit from the new and sometimes unconventional ideas that many startups come up with. These can be incredibly important for the transformation process in an era of digital technology. 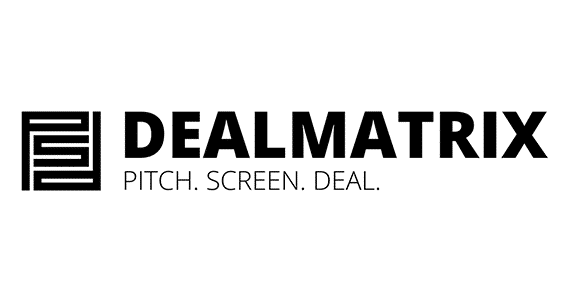 Our pilot project for matching mid-size companies with startups will be continued. CODE_n plans to invest heavily in this initiative, so we will now start to formalize the workflows that have already proven successful, noting any important lessons so that we can put everything in place for open innovation to gain further momentum. In particular, this will mean continuing to back the Impuls:Digital format. Stay tuned for updates on our blog and further info!